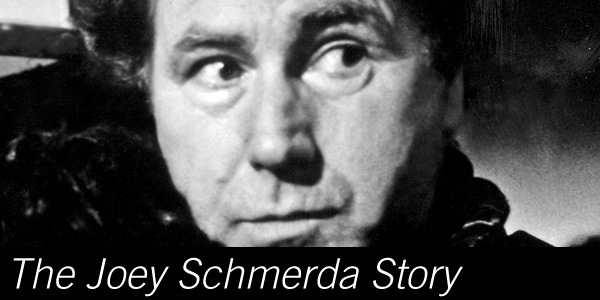 “The Joey Schmerda Story” is the tale of Joey’s experiences and adventures while trying to make ends meet in the “high” life that involves himself, his tape recorder, his girlfriend Gloria, his arch-enemy Mr. B, and Mr. B’s woeful host of hench people. In an effort to beat the undertow of social displacement and a recessive economy, not to speak of unemployment, Joey is constantly shifting his profession in order to meet the momentary demands of a modern world. At first it seems he has gotten himself involved in the smuggling of a contraband substance. But later he will declare to his girlfriend Gloria: “What I’m into now is intelligence. It’s hard to believe, but there’s people out there who’ll pay for that and pay through the nose”.